Earlier this summer, we had the privilege of coordinating Jill and Minh’s wedding at Vintage Villas in Austin, TX. 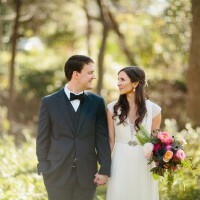 Their sweet ceremony was held in the manicured garden below which has a breathtaking view overlooking Lake Travis. Jill and Minh are an adorable couple – they met at work, in a “Scrubs” like story…Jill is a Nurse and Minh is a Surgeon. :) Needless to say, the two of them are beyond busy and needed some help to pull together their big day – so, we created a custom package for them where we provided Timeline Management, Event Design, and Vendor Selection in addition to “Month-Of” services. The couple has a love for water and sailboats (Minh even proposed on a sailboat!) so we used a few nautical elements throughout the wedding. Their day turned out so beautiful! We wish them all the best as they move to Baltimore next year for Minh’s Residency. Congrats you two! They are SO cute. I love the brown touches with the blue.